Passion for food—but not sushi—is on the menu at Ikigai. It's a little tricky to translate to English, but the Japanese concept of ikigai has to do with purpose and meaning—a reason for being—not unlike the French phrase raison d'être. Terms like "mission calling" or "commitment to a cause" would not be too far afield. Restaurant owner Johnny Kwon speaks of ikigai partly in terms of passion and of destiny. Without getting too personal, when Kwon's best friend passed away last year, the then owner of Naked Fish Japanese Bistro made a decision: He wanted to open a restaurant where ikigai would pervade the atmosphere and the cuisine. Kwon's desire to bring love, purpose and meaning to his business enterprise ultimately led him to close Naked Fish and open his new restaurant, simply called Ikigai. I was one of many who were sad to see Naked Fish close. During the past couple of years, I considered it to be one of Utah's highest-echelon eateries. Maybe Kwon was tired of seeing so many sushi restaurants open along the Wasatch Front, so he created a Japanese restaurant with nothing called sushi or sashimi on the menu. This has undoubtedly confused some patrons, who come to Ikigai looking for rolls and such. But, hey, you can get those even at your local grocers these days; what Ikigai offers is much harder to find. Should there be a wait for a table, settle into a comfortable seat in Ikigai's lobby and enjoy a snack and a cocktail like the shiso gin and tonic. I was surprised by how much I loved the hotate chips ($8) because, frankly, they didn't sound too appealing. Hotate is Japanese for scallop, and this dish from the snack portion of the menu is scrumptious housemade rice crackers (not those tasteless hockey puck-shaped things), each with a couple dollops of dried and cured scallop that has been transformed into an airy, delicious mousse-like consistency, then garnished with minced scallion. Delicate Kumamoto oysters on ice (three for $10) are subtly dressed with just a hint of ginger-infused house mignonette, and serve as a perfect meal starter. If you prefer your seafood cooked, the calamari—Japanese sea squid in this case—is kept simple: battered, fried and served with a delectable burnt garlic aioli. It's some of the best fried calamari I've ever had. The remainder of Ikigai's concise menu consists of "cold plates" and "warm plates." 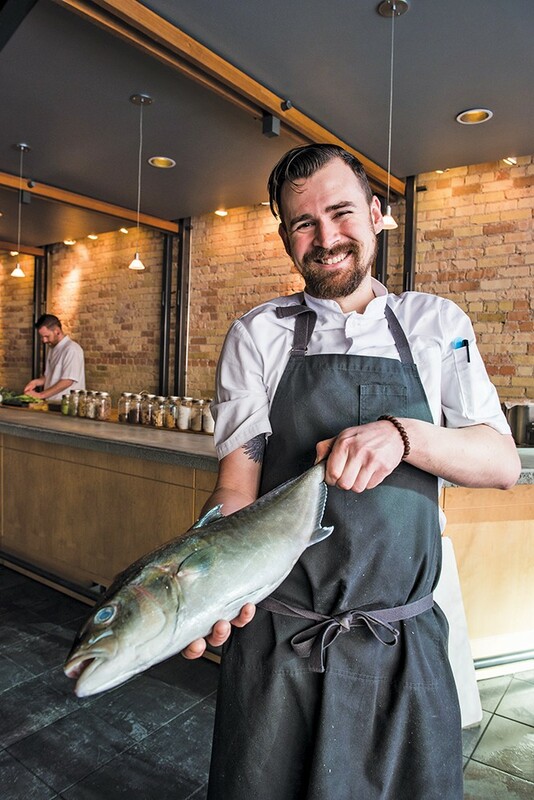 It's not easy to describe Chef David Hopps' cold amberjack dish ($14) without oohing and ahhing. Like many of his creations, this one seems, at first look, to be oh-so simple. In a way, it is, but there is more going on than meets the eye. Hobbs utilizes the Japanese method of aging/curing fish for 2-4 days before serving it up sashimi-style. This is a practice that only a handful of restaurants in the U.S. utilize. In this case, Japanese hamachi (aka amberjack) is cured in Okinawan salt and raw brown sugar for a couple of hours, then rinsed and aged for two days in a special antibacterial cypress (hinoki) box. Now, most people I know think they like their raw fish (sashimi) as fresh as can be—directly off the boat, if possible. But aging fish, much like aging a quality beef steak, imparts umami and enriches the flavor. It's a remarkable thing. The hamachi is then cut into artful pieces and served raw with subtle garnishes of puréed pickled plum (umeboshi), candied pistachio crumbs and mitsuba leaves. A richer, oilier fish like Japanese mackerel requires longer aging. But again, Hopps' aged mackerel is so full of flavor itself that it requires nothing more than a little pickled seaweed and "petite" red onions ($13). Red snapper with yuzu and green tea ($14) is also not to be missed. The "hot plate" section of the menu is full of temptations, too. Take, for instance, ramen "carbonara" ($16)—an inventive dish that combines perfectly cooked fresh ramen noodles, egg and, in the place of bacon, guanciale or pancetta. Chef Hopps brings a smoky, meaty flavor to the dish by sprinkling the top with katsuobushi: dried, fermented and smoked skipjack tuna, sometimes called bonito. Let's talk tofu. My wife (who is nuts about it) and I agree that Ikigai's agedashi ($10) is the best rendition of tofu we have ever tried. The rap on tofu is that it's bland and flavorless (which it can be) and is only rescued by whatever sauce or seasonings accompany it. That's not the case with Hopps' take—lightly fried tofu with the most delicate, crisp exterior and a creamy, soft, ethereal interior, topped simply with katsuobushi and served in a bowl with dashi broth. On one visit, a special of the evening was a visual stunner: grilled madai (Japanese snapper) head. It's seasoned, roasted and grilled while being sprayed with sake (which I would also want if my head were grilled), split down the middle and served with scallion shreds and pickled radish. It's a little scary to look at, sure, but it's a divine dish. Table service is impeccable here, and there's one more surprise in store for visitors: dessert. Elyse Osguthorpe is dessert chef as well as Hopps' fiancé, and her creations are other-worldly. Her wizardry includes an amazing toasted rice ice cream with pavlova and candied shiso leaf, and the light and fluffy Japanese "cheesecake" that's like eating clouds sprinkled with ginger beer ice pebbles, crumbled spiced cocoa and burnt honey. If you're looking for food with purpose and passion, Ikigai is for you.